I have yet to find the secret code, the nugget of information, the key that will unlock the story of the life of Alice T. A. Quackenbush, whose gardening books I've been reading these last few days. Without her maiden name, I can go no further in my quest to find her. It was much easier to find out about Ida Dandridge Bennett, the gardening author I discovered last winter, because she never married and so I knew her maiden name. Yes, I am reminded that I never finished posting all the information I had about Bennett. I just couldn't bring myself to share her whole story because it has an unhappy ending, but I think one day I shall. Anyway, reading old gardening books is a bottomless rabbit hole for me. I won't reveal how many more old gardening books I've acquired this winter, but they all relate to each other, so I felt I had to get them, to save them, to savor them. In a lovely, easy to read, conversational style, Rogers tells a bit about each writer and shares passages from their books beyond just the one or two sentence snippets that we often read over and over again. For anyone who has read those snippets and wants to know more, get Writing this Garden and come to this garden party to meet garden writers from both the United States and Great Britain, from the 19th, 20th and even 21st century. It will be one of the best parties you attend all winter. ohmy, I like this book just for its cover! Carol, just an FYI. Gene Bush has decided that, for a shade garden specialist, "there is little logic in cutting down trees to publish a hard copy catalog." So true. His catalog is available online at MunchkinNursery.com. I got this book for Christmas and highly recommend it as well. 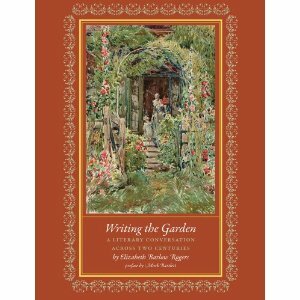 After reading your post, I went back and read "Spouses in the Garden" as a warm up for Valentine's Day. Was wondering if you've ever read much by Beverley Nichols? I love "Rhapsody in Green." I'm intrigued by your description. I wonder if it comes in audio...? Thanks for the review, Carol.